This year's end-of-summer ACCESS School Supply Drive was a tremendous success. 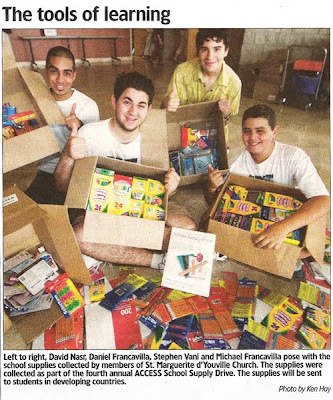 Two weekends in August were dedicated to receiving donations of school supplies and collecting funds from local donors. Over $1,700 was raised for the youth-run ACCESS: Allowing Children a Chance at Education, Inc throughout this year's drive. Donations are benefiting school children in developing countries, this year including Tanzania, Africa. ACCESS has delivered the supplies to Canadian Food for Children in Toronto to be shipped and distributed. As students in many privileged nations begin school this week, children in Tanzania will now be able to learn with the supplies they need to succeed. Fair Trade products such as chocolate and sugar were also sold at the event to raise funds and awareness of sustainable employment and development projects. ACCESS would like to extend thanks to all donors as well as St. Marguerite d'Youville and St. Anthony's Churches in Brampton, Ontario for their hospitality. View the photo slideshow below or see the online gallery here. Details on the School Supply Drive event can be found at accesscharity.ca/schoolsupplydrive.